This outing saw the band's first release in South America with Rock Brigade Records in Brazil, Chile and Argentina. Shortly after recording the band dispensed with their existing rhythm section pulling in ex-RECKLESS DAUGHTER, SHOCK TACTICS and SIAM bassist Andy Faulkner and former BENEDICTION and WHITE TRASH drummer Paul Brookes. To promote the album MARSHALL LAW put in a show at the 'Bang Your Head' Festival in southern Germany sharing a bill with DEEP PURPLE, W.A.S.P. and MOT?-RHEAD as well as a performance at the Wacken Festival playing to over 30,000 people. The early part of 2005 also saw the induction of bassist Tom Dwyer, a scene veteran holding credentials with BARDICHE, HEAT, SCREAMING DEMON and IRON SKULL. Ex-MARSHALL LAW drummer Lee Morris joined the ranks of AOR outfit TEN in September 2005. By the following month MARSHALL LAW announced they had mixed 'Axis Of Power'. New drummer Peter Hunt, a veteran of DRAGONFORCE and GEARED 4, joined the fold in February 2006. 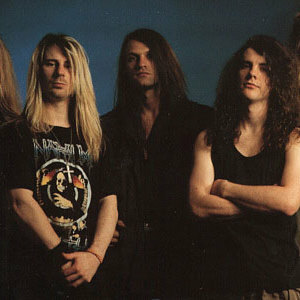 The band suffered a major blow in mid-March though, when guitarist Andy Southwell, a band mainstay since 1988, exited due to injury, Within days his replacement had been revealed as being SEVEN WITCHES guitarist JACK FROST, an American scene veteran having high profile experience with SAVATAGE, METALIUM, THE BRONX CASKET CO., SPEEED and FROSTBITE. However, Frost exited in June. His replacement, announced in mid-July, was Dave Rothan, previously of DIRTY MINDS, the GRAHAM BONNET band and 80s covers act ROCK$TAR.